Research administrator Reports to the Director, research, development and innovations and works with research assistants, professional programme students, business incubator clients, sponsors and donors and other directorate clients to provide support services on any general enquires, claims processing,, donor returns filing and other related duties as assigned. · Assist in the implementation of policies and procedures governing University Research, Development and Innovations. · Liaise with philanthropic organisations for possible Research, Development and Innovation funding. · Help in soliciting and developing funded as well as unfunded research proposals. · Identifying and mapping potential research and innovations donors and conducting periodic reviews of the donor portfolio. · Partner with the Dean of student’s services and the library to plan for the growth and accessibility of research and innovations repository. · Assist in organising of research conferences and events. · Office administration and report writing. · A business related degree or Diploma from a reputable Institution. · Should be computer literate. · Should have excellent report writing skills. · Good personal attributes and etiquette. · Those with experience in sales will have added advantage. The job holder is responsible for planning, executing and completing assignments according to established Audit Plan and schedule. He/she shall recommend appropriate internal control improvements that may include operational enhancements or efficiencies, and the preparation of audit reports as well as documenting controls. · Carry out risks assessments and evaluate adequacy of internal controls prior to the execution of an audit program. · Carry out compliance audits of financial and accounting systems with International Financial Reporting Standards. · Ensure there is a proper system of documentation of audit test work and working papers in line with established international standards. · Review the Institute wide utilization of resources and provide assurance on their optimal use. · Prepare detailed reports on audit findings and make recommendations to improve the institute’s operations. · Follow up of findings and recommendations agreed on during the internal and external audits to ensure their implementation. · Conduct investigations and special projects where applicable. · Any other duties as assigned. · Certification as a CIA, CISA or any other related professional certification. · Competence in internal control development and evaluation. · Knowledge of international accounting standards. · Knowledge of management information systems concepts and practices. · Knowledge of the Standards for the Professional Practice of Internal Auditing and the Institute of Internal Auditors Code of Ethics Ability to work independently with extensive latitude for initiative and independent judgement. · Ability to establish and maintain harmonious working relationships with co-workers, staff and external contacts, and to work effectively in a professional team environment. This position reports to the Director, (ECDP) and is responsible for the day to day Operations of the department. · To market MUA ECDP courses. · To make presentations on ECDP courses on behalf/in the absence of the ECDP Director. · To assist in programme development and proposal writing. · To carry out media monitoring to identify opportunities for the Department. · To ensure that ECDP Department is registered on a timely basis with NITA and other relevant institutions. · To process prequalification documents in a timely manner. · To attend to ECDP clients correspondences and verbal queries accurately and promptly including ensuring efficient flow of mail to and from the ECDP office. · To maintain a database and files for all ECDP clients and consultants. · To implement, maintain and update an office filling system that ensures easy retrieval and accessibility of documents. · To process ECDP consultants claims at the end of each assignment/training. · To assist in preparation of yearly procurement plan for the ECDP department. · To carry out Departmental requisitions when there is need. · Computer applications: – MS Word, Microsoft Access (Database), MS Power point, MS Excel (Spread sheet). The Social Media Intern is responsible for coordinating and executing the University’s social media strategy, working across key social media channels including Facebook, Twitter, YouTube, Instagram, Snapchat, Skype, Google and LinkedIn with the main aim of increasing the number of followers and creating consistent publicity. The intern should also follow and continuously engage with potential students and/or clients. · Collaborate with the Marketing and Corporate Affairs team and the various Departmental Heads to gain an understanding of how and what is to be communicated to reach the primary audiences (prospective students/parents, alumni, and the on-campus community). · Conceptualize, create and publish daily content (combining original text and images as well as text, images and videos provided by the Corporate Affairs Department) that enhances affinity for MUA. · Share stories of community’s successes, success stories for alumni and current students that build meaningful connections and encourage engagement. · Employ innovative tactics to grow the audiences of each of the main University social media accounts. · Serve as an ambassador for the Marketing & Corporate Affairs departments, which includes seeking out story ideas for social media as well as the website. · Encouraging members of the community and students utilizing the social media platforms to connect with the MUA social media platforms. · Bachelor of Arts Degree in Journalism and/Public Relations/Communications/Marketing or a Diploma in a similar field. · Minimum one (1) year of experience in Online Marketing and/or Social Media Management. Reporting to the Deputy Vice Chancellor, Research and Academics, the Director ECDP will contribute to the University’s corporate and strategic goals by attracting and sustaining competitive Consultancy and Training business to meet the set target. · Prepare competitive Consultancy and training proposals and bids to ensure the targeted number participants are attracted and programmes conducted. · Develop programmes and facilitate quality training to both internal and external stakeholders. · Liaise with consultants and develop appropriate and relevant programmes. · Create business linkages both locally and internationally. · Planning and overseeing implementation of new business emanating from training, consultancy and other assignments. · Preparation and implementation of training calendar. · Prepare the budget for the unit. · Develop, prepare and make company presentations for existing clientele and new clientele. · Design and implement an effective monitoring and impact assessment system for the Division with a view to improving service delivery to clients, submission of proposals within client deadlines and execution of assignments within specified timelines. · Develop methodologies to assess market opportunities and the viability of a business, analyse and interpret data to identify patterns and solutions, including surveys and focus group and finally write detailed reports and present results. · Marketing with training bias and /or human resources with Marketing Bias. Interested candidates who satisfy the requirements below should forward their applications accompanied by a detailed CV, email address, day time telephone contact, name and address of three referees. 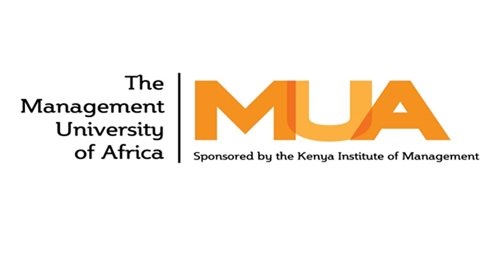 The applications should reach the undersigned not later than 12th august 2018.The Management University of Africa is an equal opportunity employer.